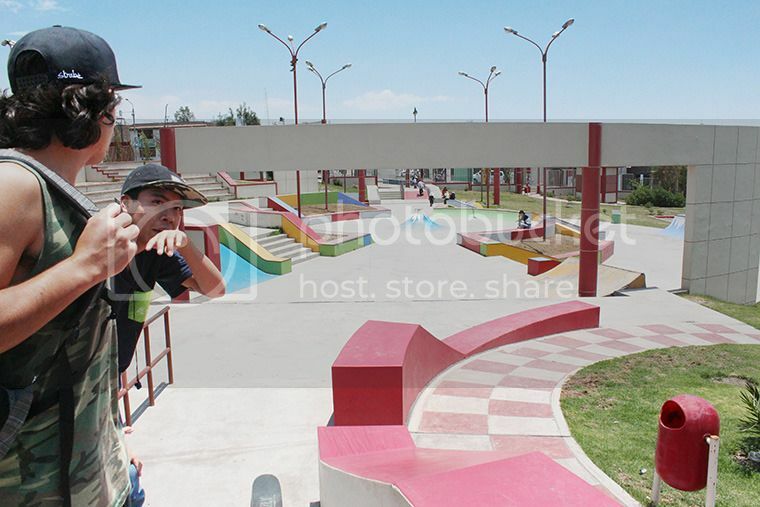 After making my way down the coast of Peru, Arequipa was the next city I was able to skate in. I met up with a lovely dude by the name of Cesar who runs Tanque Skate Shop and is one of the original legends in Arequipa. We drove to Baden Skate Park first with his friends Jose and Fernando. The park had a fairly mellow bowl and a long line of quarters, spines and banks. The surface there was pretty sketchy and the transition extremely steep. For the street kids a couple of rails were dotted along the side as an after thought. From Baden we moved onto a good-looking street spot on a quiet road, away from the city centre and tourists. While Arequipa isn’t true desert compared to the last few places I had visited in Peru, it was still a really dry and dusty environment to be skating in. After a few slams we headed to a brightly coloured street plaza in the scorching sun. 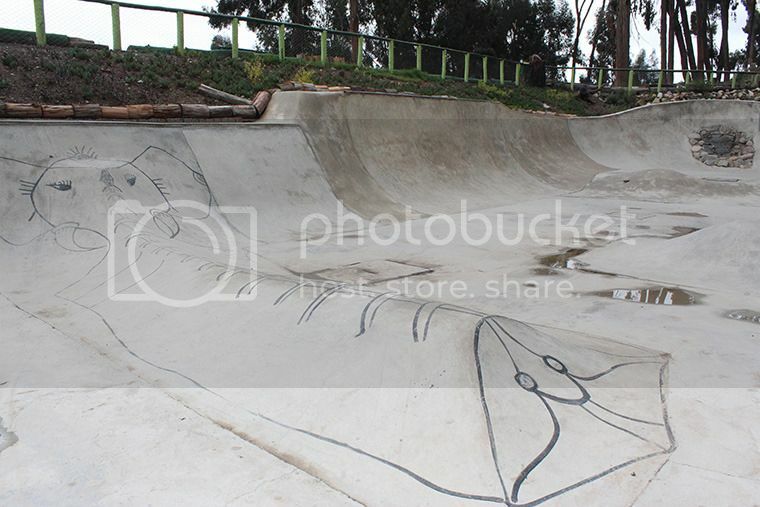 Water taps are not found at any of the skate parks, part of the reason most likely due to it not being potable. Instead, you can often buy water and snacks from a street stall positioned close by. To end the day we skated central skate park, which was close to my hostel. The park was mainly transition, all the same height and built like straight walls. It had a very weird layout and next to no flow. 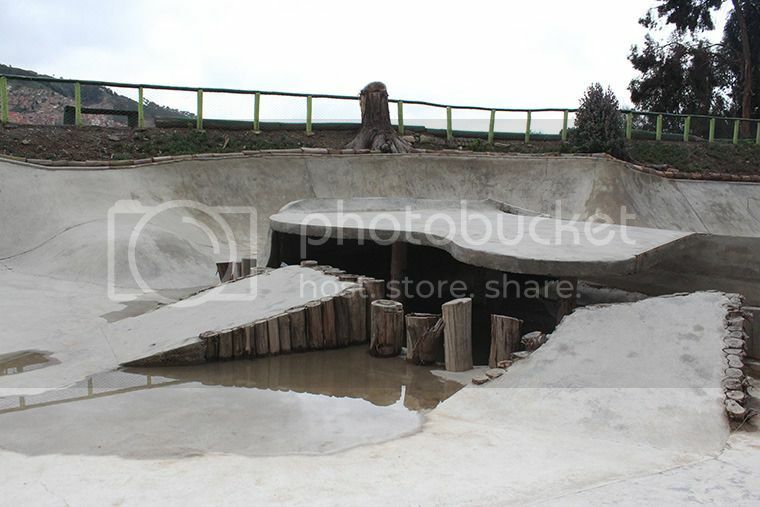 When I first decided that I would take my trucks and wheels to South America I started looking for skate parks on the internet. Not much luck was had besides one massive gem. I found this video – you must watch – on Pura Pura park in Bolivia and immediately became so amped, I knew I had to be there. 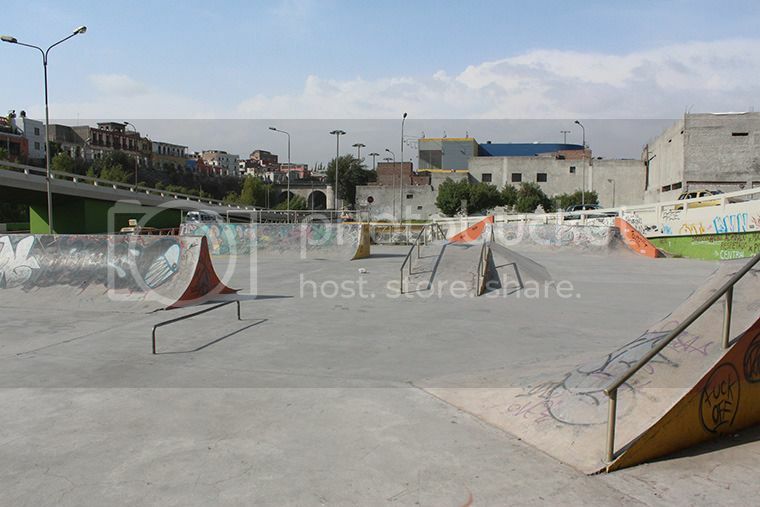 Pura Pura is the highest skate park in the world, overlooking the city of La Paz with a direct view of the surrounding snow capped volcanoes. It is 2000sqm of pure DIY build and is by far the most create space I’ve ever seen. 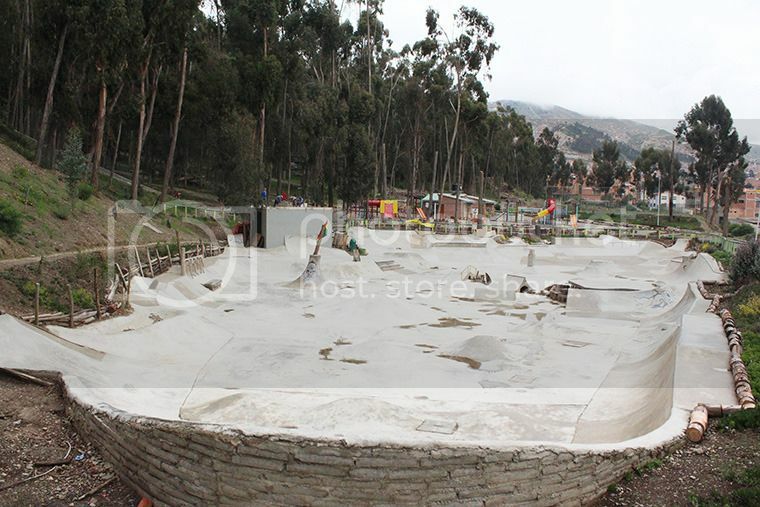 Volunteers from all around the world flew to La Paz and built it from scratch with no design, they were briefed to do what ever they wanted. When I arrived in La Paz I contacted Milton, the main person behind Asociacion de Skateboard de La Paz and, while he was busy over the next few days, he gave me directions to check out their new build project on Avenida de Poeta. 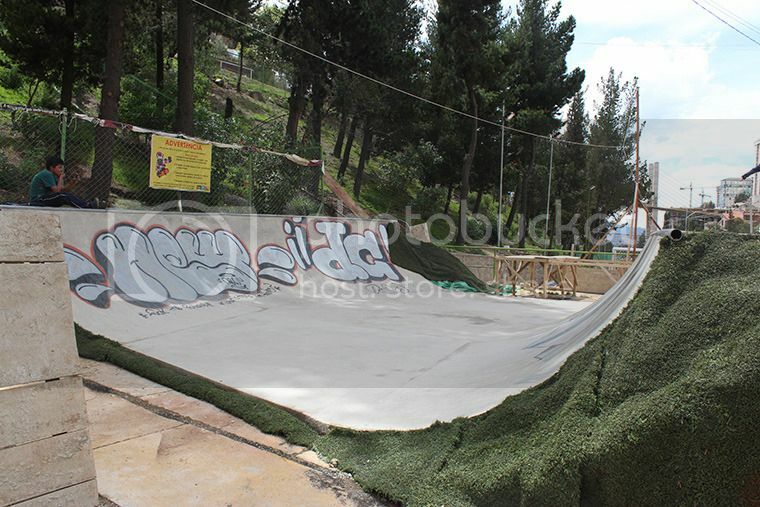 At the time I was in La Paz, the first stage of the project had been completed, which was a mini ramp with a hip in the middle. 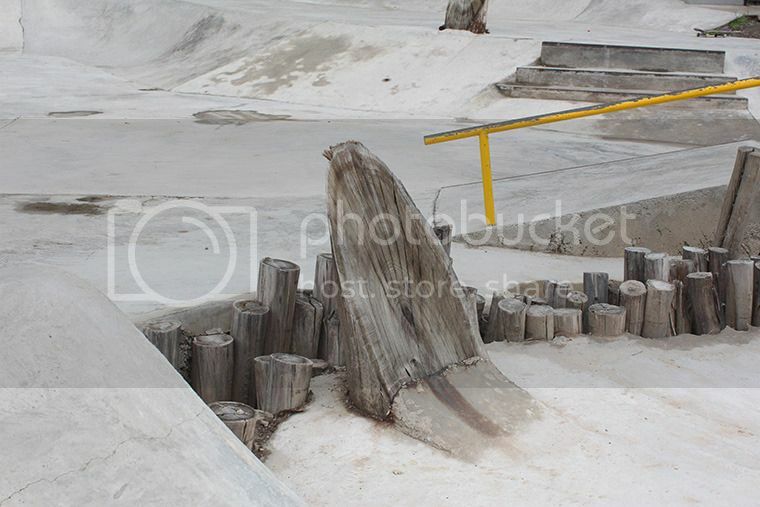 The concrete was so smooth and fresh, it made it really fun to skate. I had the place to myself for most of the time, only sharing it with two young kids who looked like they were just learning to skate and had really old boards that had been handed down to them. I had planned to head to Pura Pura in the afternoon though it started raining not long after lunch, which seems to be a regular occurrence in La Paz that time of year. The next day I walked down the road from my hostel and tried to find a particular mini van that would take me up to Pura Pura. All I knew was the number of the mini van I had to get on, I figured I would be able to ask the driver where the park was or see it from the road and then be able to get off at the right time. When the van I needed finally arrived, the driver had no idea what Pura Pura was, though I decided to jump in anyway. We weaved up the windy, mountainous roads as I searched out the windows trying to find any signs of a skate park. A man tapped me on the shoulder at one point and told me I needed to get out. He had understood what I was searching for and pointed me in the right direction of a forest reserve. I thanked him and started walking down a path, hoping I was going the right way. Eventually, I stumbled upon the skate park. The sight of it was breathtaking. The layout was huge and the view of the city was incredible. I slowly wandered down to where I could see people building and introduced myself. I met Tim who was working for Soforthilfe, a German not-for-profit organisation. They had coordinated with the local La Paz council to build a Skate Haus (house) with local men who had been rehabilitated for drug offences. The Skate Haus, once built, would serve as a place where homeless or poverty stricken children can be educated without discrimination and free of charge. Seeing as Bolivia was by far the poorest country I visited while in South America, there was no doubt this initiative was a great idea. The park itself was still wet and filled with water in a lot of places so I found a broom and spent most of the morning sweeping water out of the way and encouraging it to dry. Two other German lads, Jorg and Johannes (or Joe), who work for Make Life Skate Life, arrived soon after and helped out. Make Life Skate Life is another German organisation that spreads the love of skateboarding around the world, including projects in Jordan and India. The Pura Pura project was originally started by Make Life Skate Life and Levi Jeans helped financially towards the end of the project. All three of the German’s knew English as well as Spanish which was lucky for me as I wouldn’t of learnt half as much as I did about the project without them. I spent the whole day skating Pura Pura, until the reserve closed its gates in the afternoon. 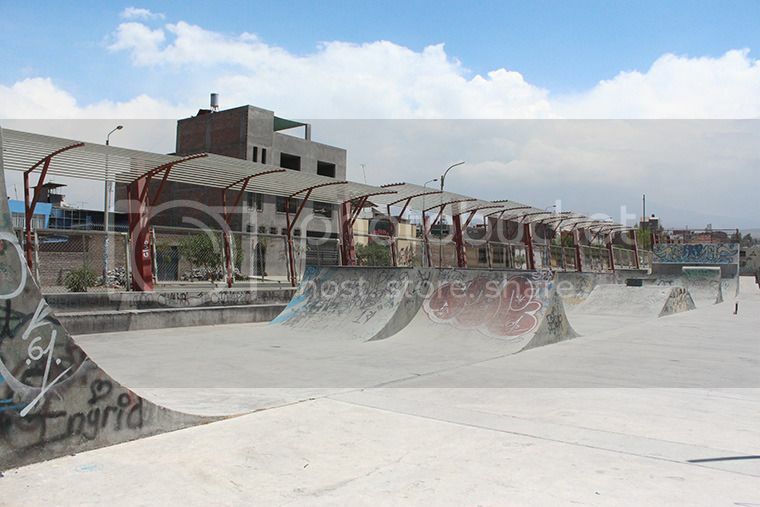 Throughout the day more locals filtered in to skate the park, though it was clear that skateboarding is a relatively new sport for the people of La Paz, though their curiosity and excitement about it was really lovely to see. There are no true skate shops in La Paz, besides a small shop called Camel run out of someone’s house, so the majority of the kid’s boards are donations from Germany. 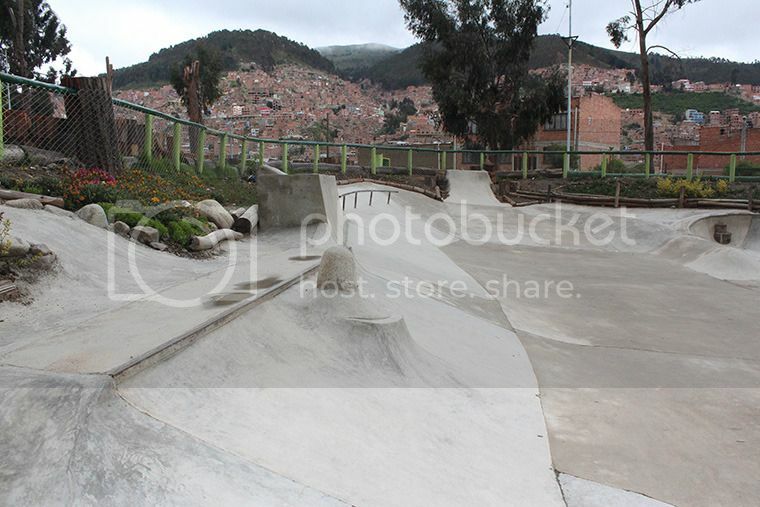 Towards the end of my stay in La Paz, Joe showed me a place called Pachamama Skate, which is a tiny mini ramp hidden at the back of someone’s house. 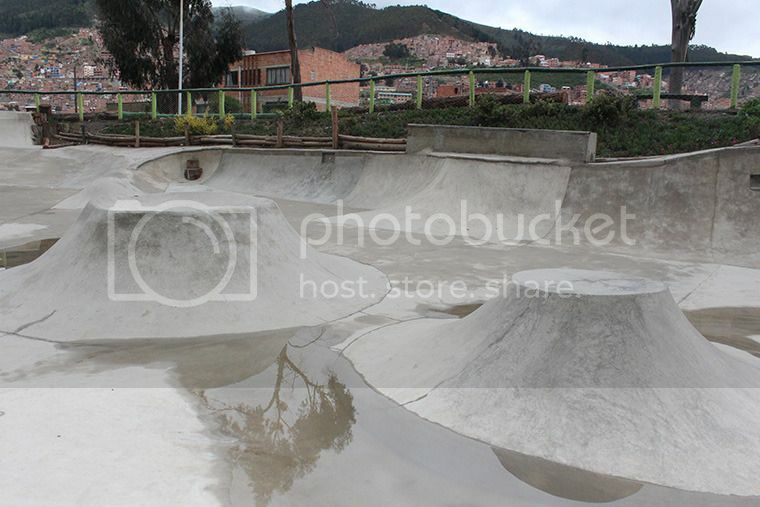 For an entry fee of Bs/10 (bolivianos) you can skate for as long as you like. Street skating seems to be a decent alternative to the lack of parks in La Paz though due to how mountainous the city is, downhill skating and power slides play a large role in the everyday mission. I wasn’t expecting to go skating in Valpariso as no one I had met so far had connections there and I hadn’t researched any parks as I had to rush a bit towards the end of my trip. Valpariso is an amazing city filled with artists, musicians and skateboarders, all of who flock to the streets to socialise and engage in their passions. One afternoon as I was walking back to my hostel I ventured down a side street I hadn’t previously seen. Completely from luck, I found myself standing in front of a skate and grow shop called Neuro Skategrow. I went in and started talking to the owner Italo who showed me some Chilean music and skateboards, including Sunrise, Mind Bang, Semilla, Ritual and personal favourite, for the graphics alone, Camba. Italo also showed me a list of different marijuana seed varietals you can purchase over the counter as well as indoor growing set ups. 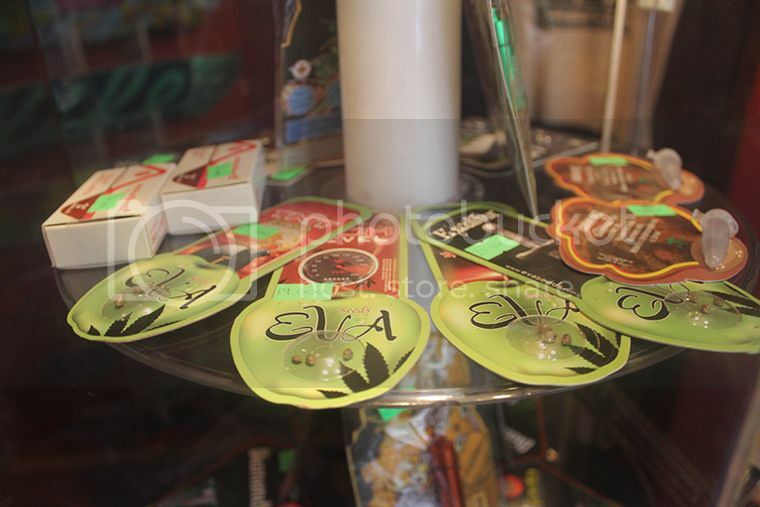 Selling these products is totally legal in Chile though possession and smoking is still illegal, even if this appears to be pretty relaxed in Valpariso. Italo introduced me to his brother Matius who was kind enough to take me to a skate park in Viña del Mar, a beach city close to Valpariso. 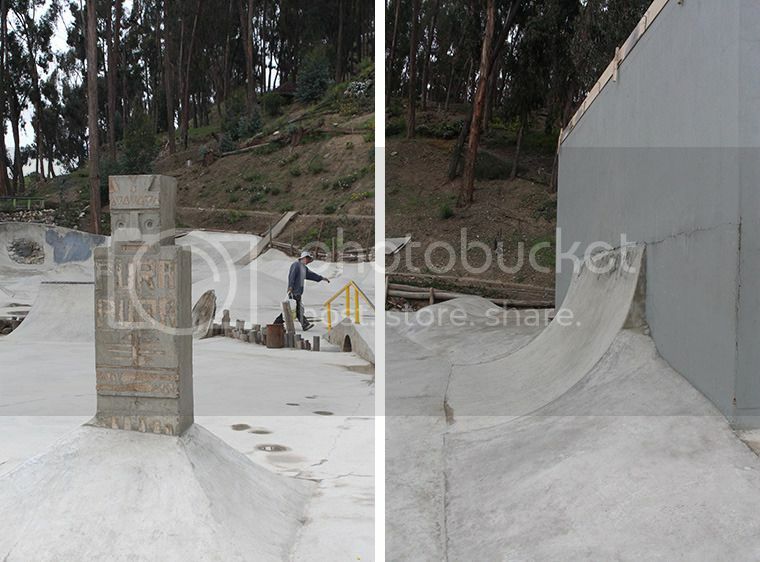 The park was really fun to skate, filled with quarters, bumps, a big bowl and stair sets. The park is open until 3am with lights and is equipped with a security guard, much needed in South America. If only parks in Brisbane were open this late. We stayed there until midnight and hid down by the bowl with some of Matias’ friends while we drank a carton of white wine out of a honeydew melon we carved and ate along the way. This was quite an ingenious idea, earning the name Melvin (wine in Spanish is vino). We also added a little sugar syrup to counteract the strong taste of goon. Santiago was one of my least favourite places I visited in South America. While some areas were pretty bohemian, the rest of the city looked and felt like it could be any capital city in America, Europe or Australia. On the skating side, I was told that there are at least 15 skate parks in Santiago. While I was originally trying to reach a particular park, I accidentally caught an express metro train that went past the station I intended to get off at, though did stop at Pudahuel where another park was located. 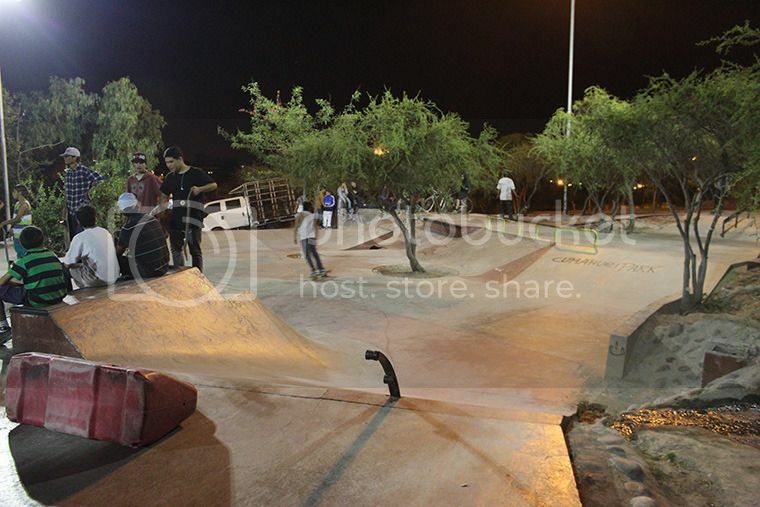 Pudahuel was packed, not only with skateboarders but also rollerbladers. It was really smooth and had lots of transition and banks. I skated until around 10pm and left to get the metro as I didn’t have a solid idea of when it stopped running. Most people were in their own cliques and didn’t really talk to me besides one rollerblader by the name of Rod who was pretty rad. It was interesting to see how rollerbladers and skateboarders interacted far more in South America than back in Australia. Rod and his friend ended up walking me back to the metro and giving me a free ride with an app they have on their phone that tops up their travel card with fake money. We definitely need this for the high Translink charges in Brisbane. There is a girls skate organisation based in Santiago called The Girls Skate Crew Chile, run by a girl called Javiera, though unfortunately our free time didn’t line up while I was over there so we couldn’t skate together. Definitely worth checking out though if you’re interested in travelling to Chile.